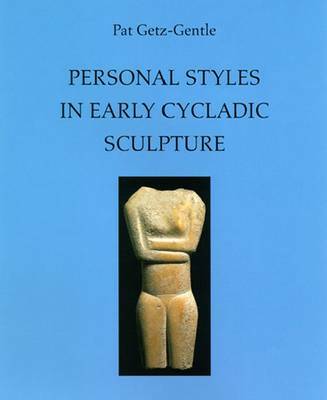 The definitive work by the foremost expert on Cycladic sculpture Personal Styles in Early Cycladic Sculpture represents the culmination of some thirty-five years of study. Pat Getz-Gentle offers here much new material and many fresh insights into a tradition, rooted in the Neolithic period, that spanned most of the third millennium B.C. Getz-Gentle begins with a review of this tradition, placing particular emphasis on the stages leading to the reclining figure with folded arms that is the unique and quintessential icon of the early Bronze age culture at the center of the Aegean. She then focuses on the styles of fifteen carvers, several of whom are identified and discussed here for the first time. By introducing little-known pieces attributable to these sculptors, she illuminates various phases of their artistic development. With a strong aesthetic sense and a practiced approach grounded in keen observation, Getz-Gentle provides clear and detailed discussions illustrated by photos and drawings of 212 different works. Complementing her observations is a chapter by art historian Jack de Vries, who offers the first published summary of his study of Cycladic images and tests the validity of Getz-Gentle's view that, in designing their works, Cycladic sculptors took deliberate measures involving the use of proportional formulae.